The correct answer is at the bottom of this post. I’m sure many of you got it right (the problem isn’t difficult, after all), but others will have leapt to the wrong conclusion and answered that the ball costs 10c. What’s more, even those who found the right answer will almost certainly have had the answer “10c” spring unbidden to their minds before putting it firmly to one side. Why? This puzzle is not my own, as you may have guessed from the choice of currency. I quote it from the book I’m reading at the moment, Thinking, Fast and Slow by Daniel Kahneman (2011). Kahneman is a psychologist, but he won the Nobel Prize for Economics – largely by demonstrating that (contrary to the assumptions built into most economic models) human beings are not rational in their decisions when it comes to money, or much else. This is not news to novelists, but Kahneman provides fascinating details about the ways in which our irrationality manifests itself. I’m not here to review Kahneman’s book, though I highly recommend it, but I want to mention the fundamental model he uses for human judgement and decision making, which I think has some interesting applications to writing. Kahneman talks of two systems, which share the work of thinking. System 1 is intuitive, instinctive, semi-conscious: we use it to do routine tasks such as walking, as well as for our initial judgements of situations. It was your System 1 that came up with the answer 10c. System 2 is conscious, effortful, and sometimes lazy: we bring it to bear in unfamiliar situations, or if we have reason to believe that System 1 isn’t to be trusted. If I ask you to multiply 2x2, System 2 probably won’t need to get involved, but for a sum such as 24x93, it will. Not only that, but the two systems compete for resources. As Kahneman points out, if you ask someone to multiply 24x93 in their head when they happen to be walking, they will typically stop to work it out – to free up extra mental capacity. When you become expert at something, it becomes less conscious – moving from System 2 to System 1, in Kahneman’s terms. If you’ve learned to drive, or touch-type, you’ll have experienced this: actions that were at first conscious and effortful become “automatic”. In fact, although I touch-type quite well I would be unable to tell you the layout of a QWERTY keyboard: that knowledge has migrated from my conscious mind, where it could be retrieved by System 2, to my fingers. Similarly, I would be hard put to say whether the clutch is to the left of the brake pedal or vice versa. Happily, my feet know. This has got me to wondering about the roles of Kahneman’s two systems in writing. Writers sometimes find themselves in that luxurious place known as “the zone”, in which consciousness appears to take a step back, and words flow onto the page like honey (but without the mess). On such occasions writing appears effortless, intuitive – the product, one might imagine, of System 1 – and specifically of an expertise that has become automatic. Most of the time, however, it’s not like that, and both systems are involved. System 2 is there, judging whether what we’ve written says quite what we wanted it to; whether it’s in the right place; whether we need it at all. System 1 is taking in the overall shape of the text, and finding it satisfying or otherwise; it’s suggesting dialogue and plot for System 2’s approval. Both systems are unfortunately unreliable: System 1 (as we saw in the puzzle at the top) likes to go for the obvious answer, or (in writing terms) the cliché; System 2 is liable to swing between a lazy dereliction of duty and hypercriticism that can choke writing off entirely. A good and productive writer will be able to find a balance between the two, and judge at any moment which ought to be taking the lead – which rather implies a System 3 for making this kind of decision! 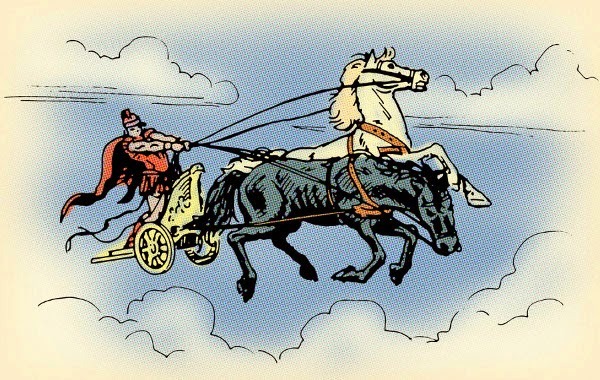 In fact, as so often, Plato got there first, with his allegory of the chariot – but Daniel Kahneman has taken my understanding of my own thought processes a lot further. What's your experience? Do you recognize these descriptions from your own writing life? Answer: The ball costs 5c. Strewth, Cathy. This is why I always hated maths so much. WHY does the ball cost 5c? Because in this puzzle, the word 'more' has been given the meaning 'more *including the price of the ball*'. But when I see a puzzle like that I understand 'more' in a different sense: I have paid 10c for the ball, but since the cost of both items together is $1.10, to buy the bat as well will cost an *additional* $1. I also take into account likelihood and experience: shops commonly round up prices to neat figures. Thus, as a child and even now, mathematical problems were always experienced by me as a ghastly series of unfair tricks. And having got that out of my system, oh if only one could turn the systems on and off like taps, a little of this and a little of that to get the misture right! But you can't. Not in my experience, anyway. Fascinating! Do you think that System 1 is largely governed by the 'right brain' and System 2 by the left? You know a book idea won't fly when it refuses to move into System 1. Kath, I think the puzzle is pretty unambiguous. The bat costs a dollar more than the ball costs: it's not including the price of the ball in the cost of the bat. It's only if the ball costs 5c (and the bat therefore costs $1.05 - i.e. one dollar more than the ball) that the two together add up to £1.10. I don't think it's a trick question, but it is slightly counterintuitive - that is to say, it looks like something System 1 ought to be able to handle, but actually requires the services of System 2. Nick - I had exactly the same experience! I reason exactly as Katherine does: the ball costs 10c and then the bat costs 1 dollar more. But then I was and am hopeless at maths,my progress was impeded by my helpful grandfather who tried to apply logic to the mathematical problems I brought home. "If 2 men take X time to build a wall, how long do 3 men take?" He would dsay it depended on their work rate, the mood the foreman was in, the length of the tea break... and if you said: well, the puzzle implies "all other things being equal", he would reply that in real life they never would be, so the question was pointless.... As for the one that asked how long it took to fill a bath with both taps on and the plug out, he thought anyone attempting such a thing should be removed to a safe place by men in white coats. But this is why my maths grades tended to sit around 27%. Clearly you're not alone, Kath, since Sheenagh read it the same way. If the second line had simply been "The bat costs one dollar more" then I think I might have read it that way too, but "The bat costs one dollar more than the ball" seems pretty clear to me - indeed, I'm struggling to see how it could have been expressed more clearly. Oh yes, I recognise this conflict of systems and the tension between them often leads to paralysis. Yes, interesting Catherine. Writing with the right hand does activate the left hand side of the brain, which could be why we are encouraged to do this at school. Left brains are logical, respond to systems, order, rationale. (It's apparently not completely divisive, but generally.) And the right brain is intuitive and is activated by using the left side of the body. Heather, I think it's more that most people are naturally right-handed, isn't it? Of course, in the past there was a lot of pressure for left-handers to use their right hand, for dubious social and pseudoscientific reasons - which caused much unnecessary suffering and other problems, such as speech impediments - George VI being a well known example. I'm not sure whether there's any connection between handedness and the Systems described by Kahneman - who is a psychologist, not a neuroscientist - but it's an interesting speculation. I began learning a fretless stringed instrument two years ago. And quickly realised how important System 1 is. Musicians call it 'muscle memory' but it's a lot more than that. Unfortunately when on stage in front of an audience you cannot stop and reach for System 2. BTW performing is jolly helpful for understanding what's going on in your head while writing. Patrice, yes, that's a very good example! Great post! I do recognise the system 1 and 2 description for writing - it's a bit like what I called the dreamer and the editor in an earlier post - and I agree, it's hard to get the balance right sometimes. The funny thing with the maths problem, is I instantly thought - 'Ooh, it's difficult isn't it, because you have to take one up and one down at the same time and work out where the addition of the two is 110. Mmm, that might need algebra' - and then a part of my brain went, 'No, stupid, it's 10 and 100.it's actually easy! ', and my system 2 brain caved in and agreed - and then was very cross when it realised it had been duped by the intuitive system 1 brain!! But in contrast to Kath, I loved maths, and am always happy to set about a complex problem by saying, let the answer be x...! I loved your Dreamer and Editor post, and agree this is covering very much the same territory, when it's applied to writing. But Cathy, if the question been presented in the same way as your Toyota and Audi example, it would simply have read 'The ball is 5c. The bat costs $1 more than the ball'. I would then (probably) have said 'the bat costs $1 and 5 cents.' But when the combination of costs is presented first, and if a salesman said to me, 'A Toyota and an Audi cost $11000, but the Toyota costs $1000 dollars more than the Audi - well d'you know, I still can't do it. Well, I got a first in maths and still thought the ball cost 10c for about 2 seconds... quickly followed by "No, no, that's wrong! Work it out properly you idiot..." So it took me about another 10 seconds to get the right answer, and then 20 more to check it wasn't a trick question after all before looking at the answer. This is obviously why writing a book takes me so long... I keep adding a third stage, when the two systems are arguing about it!